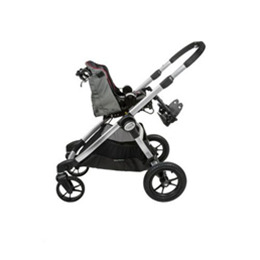 The universal Zippie® Voyage™ early intervention device combines Baby Jogger™ stroller expertise, Zippie’s incredibly versatile seating for growing babies, and one of the largest selections of functional accessories in the industry! 45°of rearward tilt and an optional 45° of recline assist with feeding, digestion, respiratory function, and visual orientation, while forward tilt helps babies bring their hands to their mouth and reach for objects. Tilting and reclining the seat is as simple as engaging bicycle break-style levers behind the backrest. For maximum interaction, face the seat rearward toward you. Or, face it forward so your child can explore their surroundings.